Fossil, the American clothing and accessory maker, revealed their intentions to make a smartwatch powered by Google’s Android Wear operating system. Today at a Intel’s Developer Conference Fossil took to the stage to give a brief glimpse of their new wearable devices. Yes, you read correct, devices. Fossil showed not one, not two but three new wearable devices. The first wearable is more like a basic activity tracker whilst the second is a semi-smartwatch type. The third is what interests us. 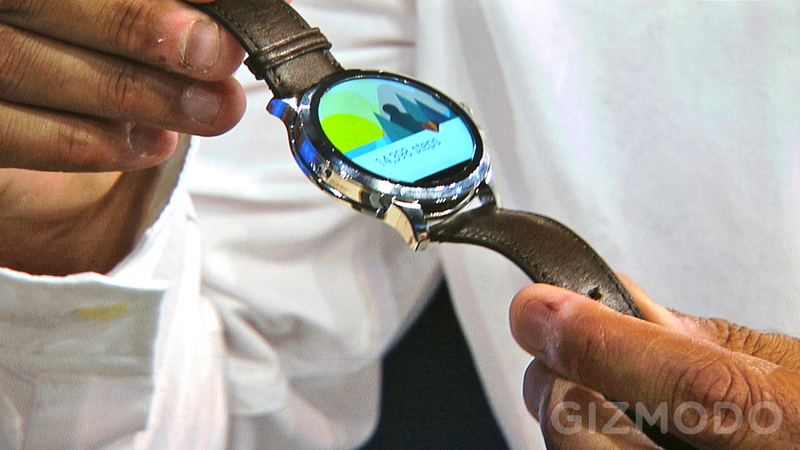 The Android Wear powered device appears to have a silvery finish and had leather bands attached to metal lugs. The watch also has the infamous “flat tire” on the bottom of the display just like the Moto 360. In fact, I found the device to resemble the leaked images of the second generation Moto 360. When it comes to specifications, we know absolutely nothing other than the fact that an Intel processor will power the wearable. Although Intel is not well known for low power consuming processors, they are going to supple the SoC for the new Tag Heuer smartwatch as well thus indicating that Intel has some sort of low power SoC in tow. Interestingly, this is not the first time Fossil has tried its hand in the smartwatch market. Back in 2004, Fossil teamed up with Microsoft to launch the SPOT watch. Unfortunately, the impractical yet futuristic device did not do well and the project was ditched in 2008 (it is worth doing a quick Google search to find out what happened). This time, with mobile technology far more advance and a market getting used to the idea of smartwatches, Fossil could make an impact. Fossil is known in the market as an “accessible luxury” watchmaker meaning it offers some high quality stuff that won’t break the bank. I myself use a watch made by Fossil and can vouch for the quality. Currently their most expensive watch sits at about $285 which is actually less expensive when compared to some current Android Wear devices. If the company chooses to offer their new product at a price which is more competitive than current Android Wear offerings, Fossil could actually make some good money and grab a share of the market. Stamping a well known accessory making brand name next to Android Wear is great news for Google. Having Tag Heuer on board was awesome but it is highly unlikely that any of Tag’s watches will be affordable. With Fossil, there is a much wider appeal and greater scope to sell Android Wear powered products. At the end of the day, sales will be determined by how the different companies selling Android Wear devices can attract customers. In terms of brand recognition (when it comes to watches) Fossil already has a head start, all they need to do now is put a good device on the table and not price it stupidly. Keep your eyes open for more details regarding the newest Android Wear announcement.